The popular actress, published author and prolific blogger talks about the science of growing up and the art of good oral hygiene. We're big on teeth and oral care! Mayim Bialik is a PhD neuroscientist, actor, vegan and mother of two sons who love to floss! She sat down with Dear Doctor – Dentistry and Oral Health magazine to discuss her career, her education, her new book, her sons and oral health. 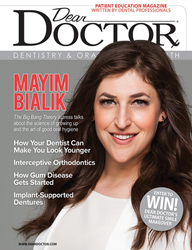 In the latest issue of Dear Doctor magazine, available in dental offices throughout the U.S. and Canada and online at deardoctor.com, Bialik talks about raising sons in a vegan household and stresses the importance of good oral hygiene. “We’re big on teeth and oral care,” she says. Bialik got into acting as a child and says she didn’t have a single cavity growing up but had a “pretty profound overbite” while starring as the title character in the 1990s television show Blossom on NBC. However, being in front of the camera for 5 years did not allow her the opportunity to have braces. She hopes to help other girls navigate adolescence with her #1 New York Times bestseller, Girling Up: How to Be Strong, Smart and Spectacular, which she describes as “a neuroscience-driven perspective on all aspects of being female.” In the book, Bialik provides the kind of information she wishes someone had explained to her when she was young. Dear Doctor - Dentistry & Oral Health is a patient education magazine available in dental offices throughout the U.S. and Canada and online at deardoctor.com. Written exclusively by dental health care professionals in uncomplicated language, Dear Doctor aims to open the lines of communication between patients and dental professionals by providing patients with information to help them make confident, informed healthcare decisions. Learn more at http://www.DearDoctor.com.